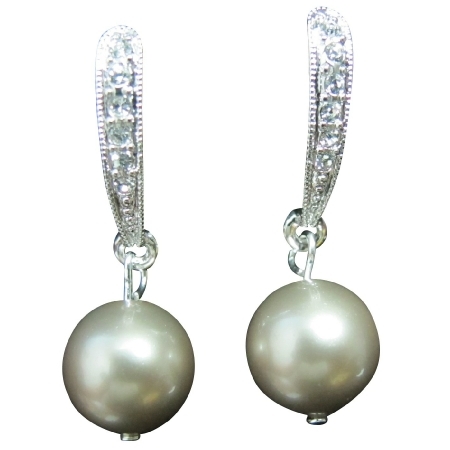 This Swarovski platinum champagne dangling pearl surgical post earrings are extremely trendy. Besides the pearls it also has shining rhinestones, making it an ideal wear at a party. Material Used : 10mm Genuine Swarovski Platinium Champagne Pearl drop from rhinestones surgical post earrings. Free Customization Service : We can make matching necklace / bracelet and/or customize the Jewelry per your style, color choices. This item in Designer Earrings & Jhumkas category was first added to our catalog on 12-07-2013. Buy Trendy Handmade Latte Pearl Surgical Post Earrings, sold & shipped by Fashion Jewelry For Everyone where you can shop online for Leading Online Retailer for Indian Fashion Jewelry. This Earrings collection has been tagged as swarovski, pearls, bridal, rhinestones earrings, holiday gift set, bridesmaids, fashion jewelry.